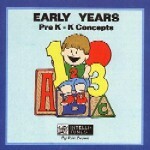 This collection of lively little tunes are written specifically for the very young learner. lots of giggles are all just a part of EARLY YEARS. Come join the fun with this most delightful way to listen, learn and grow. to be a teacher, movie star, artist, author, etc. knock, snap fingers, clip, grin, blink, lick, hop, kick, shake, etc. wiggle nose, touch toes, blink eyes, jump high, etc. duck, chick, pig, cow, donkey, sheep, turkey, etc. plates, tires, money, checkers, CDs, buttons, etc. These are adorable songs that will delight any young child -- and they’ll learn important lessons too! Classic tales like The Gingerbread Man, Three Billy Goats Gruff, Little Red Hen, Henny Penny, Three Little Pigs and Goldilocks and the Three Bears come alive with this collection of great little tunes that teach story sequence,character development and vocabulary.